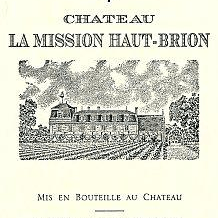 Chateau La Mission Haut Brion 1970 wine. Surprisingly, Mission 1970 is not the success that one might expect of this vintage. This is a very good balanced wine. Chateau Haut-Brion, La Mission has actually shared ownership with its neighbore, While just a narrow suburban street divides the two properties--both are located within the city limits of Bordeaux--La Mission's wines maintain their distinctive wilder identity: more powerful and more tannic, often displaying a meaty, truffley character with extended time in bottle.